The Florida-Alabama Transportation Planning Organization (TPO) is the local, intergovernmental transportation policy board for Santa Rosa and Escambia counties in Florida and part of Baldwin County, Alabama. The board is comprised of local government officials who make decisions regarding transportation at the regional level. The Florida-Alabama TPO is required by federal and state legislation to establish a continuing, cooperative, and comprehensive planning process. The TPO also works to increase safety, security, accessibility, mobility, and connectivity for people and goods. In addition to the TPO board, the Florida-Alabama TPO has a Technical Coordinating Committee (TCC), a Citizens’ Advisory Committee (CAC), and a Freight Advisory Working Group (FAWG). The TCC is made up of local government staff and other stakeholders. Their knowledge of local projects and issues allow the members of the TCC to provide technical advice to the TPO board. The CAC is comprised of members from the general public who express an interest in transportation planning. Prospective members complete an application and must be approved by the committee and the TPO board. The Freight Advisory Working Group provides a forum for open dialogue where the freight community can gain insight into the TPO’s decisions and upcoming projects and provide much needed industry input to decision makers regarding freight transportation priorities and expenditures. The FL AL TPO has determined its Disadvantaged Business Enterprise (DBE) goal for FY 2016-2018 is 2.14%. Beginning July 13th, the proposed overall goal and its rationale are available for public comment at the West Florida Regional Planning Council, 4081 East Olive Road Suite A, Pensacola, Florida 32514, during normal business hours. This comment period will be open for 30 days. The Florida-Alabama Transportation Planning Organization (TPO) usually meets six times a year on the second Wednesday of the month at 9 a.m. in either Escambia County or the Santa Rosa County. Prior to each TPO meeting, the TPO’s Technical Coordinating Committee (TCC) meets at 8:30 a.m. and Citizens’ Advisory Committee (CAC) meets at 10:30 a.m. on the Monday before the TPO meets. All public meetings of the Florida-Alabama Transportation Planning Organization (TPO), the Technical Coordinating Committee (TCC), and the Citizens’ Advisory Committee (CAC) are tentative. 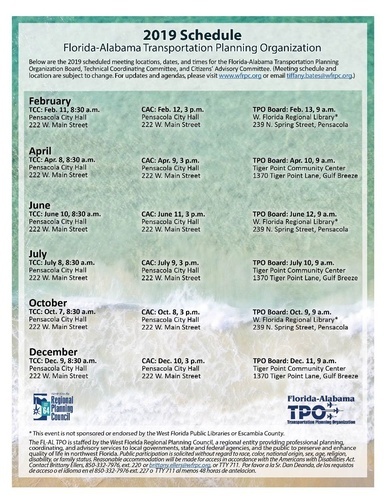 Public meetings of the FL-AL TCC and FL-AL CAC will take place in Pensacola City Hall, Vince Whibbs Room, located at 222 W. Main Street, Pensacola, Fla. The Florida-Alabama TPO adheres to the Americans with Disabilities Act and will make reasonable modification for access to their meetings upon request. Please contact Public Involvement at 850-332-7976 to make a request. Requests must be received at least 48 hours in advance of any meeting to allow the TPO time to provide requested services. MEETING TIMES AND LOCATIONS ARE SUBJECT TO CHANGE. PLEASE CHECK CURRENT AGENDAS TO CONFIRM TIMES AND LOCATIONS.